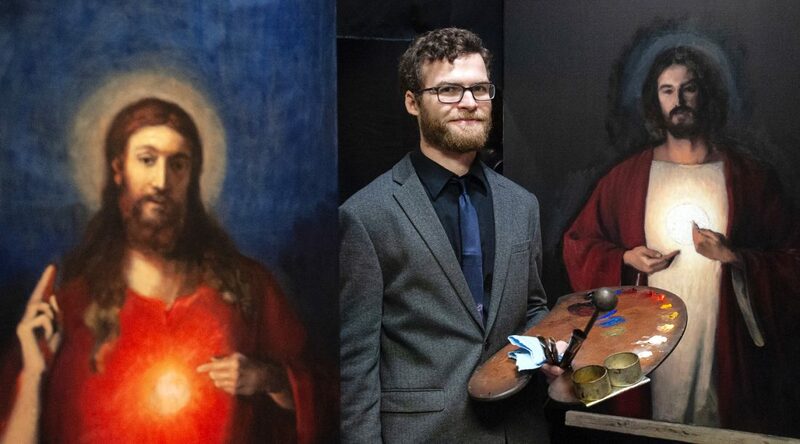 Sarah A. Miller/Tyler Morning Telegraph Robert Puschautz stands between two of his paintings, two versions of the Sacred Heart of Jesus, that are in progress at his studio. TYLER, Texas – While viewing Robert Puschautz’s “Madonna of the Roses,” Tyler residents may feel they have a clear symbol of their city’s connection to God’s plan. The Tyler Morning Telegraph reports in the painting – which is inspired by a work by William-Adolphe Bouguereau that bears the same name – red roses drawn from those in the Tyler Municipal Rose Garden spring up in full bloom from a bush that surrounds Mary and Jesus Christ. The trees in the background are modeled from those created by American landscape painter George Inness, but might remind some of the Piney Woods of East Texas. Because Puschautz, a Chicago native who now lives in Tyler, avoids using photographs to create his works, even Jesus Christ was drawn based on a model – in this case his neighbor’s sleeping baby. “I had an idea of how I wanted the baby and then the baby would be in that position and the he would move and I’d be like ‘well, there goes that,” Puschautz said. “He ended up rolling into this position like this and that I was not intending and it ended up being perfect. “When life changes on you, you adapt and you incorporate it into the work,” he added. Since June 2018, Puschautz, 30, has been creating sacred art for the Roman Catholic Diocese of Tyler as the Stabat Mater Art Fellow of the St. Philip Institute of Catechesis and Evangelization. In his role, Puschautz is responsible for creating eight to 10 works a year, although that can vary based on the size and scope of the project. Bishop Joseph Strickland, of Diocese of Tyler, assigns Puschautz projects. Puschautz begins his process with research by reading theology, history and scripture, as well as finding sacred art created by the masters. He will follow up his research with drawings, often using live models, mannequins and other paintings. Once his paintings are completed, the bishop then chooses where the works go. Diocese of Tyler covers parishes in 33 counties. Two works Puschautz is still painting that relate to the Sacred Heart will likely be sent to two of the diocese’s four Sacred Heart parishes upon completion. Puschautz’s “The Immaculate Conception” currently hangs inside the Cathedral of the Immaculate Conception in downtown Tyler. Luke Heintschel, director of communications at the St. Philip Institute, said having an in-house artist at the parish allows parishioners to feel a closer connection to the sacred art they see. He said Puschautz’s “Madonna of the Roses” was an example of a painting where people can easily relate the artwork to their own lives. Heintschel added that Vatican II approves of the use of sacred art in parishes and that having someone who creates it for a diocese has become a bit of a rarity in the 21st century. Puschautz said he hopes those who view his art are able to feel a spiritual connection.